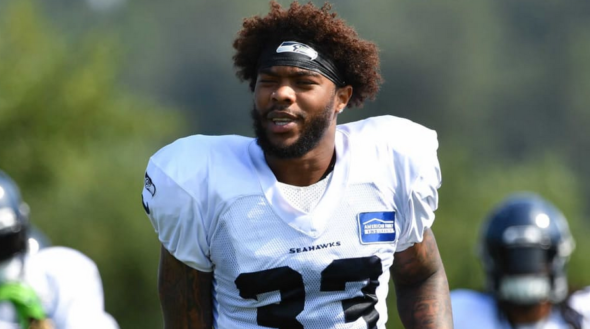 The post-Boom Seahawks world debuts Thursday night with Tedric Thompson going from eight snaps as a rookie to replacing future Hall of Famer Earl Thomas. Jeez. Nowhere among the many Seahawks changes is the dropoff steeper than at free safety. From destroyer of worlds Earl Thomas to sandcastle-building Tedric Thompson is a gap of years, experience and talent that fairly screams. Then again, everyone thought coach Pete Carroll was nuts in 2012 when he started Russell Wilson in his rookie year. Thompson, owner of eight NFL scrimmage snaps and lots of special-teams work in his 2017 rookie season, likely will step into the absent Thomas’s position in the starting lineup at 7 p.m. Thursday when the Seahawks open the exhibition season at the Clink against the Indianapolis Colts. Carroll this week was eager to tamp down anxiety among the 12s that Thompson, a fourth-round pick from the University of Colorado, where he the college nation in pass breakups (23) his senior season, was in over his head. “He’s done nothing but good stuff,” he said. “He’s had no reason not to feel good about himself. But he’s still got to make that transition to the game and then show up. We need to see him respond to when things don’t go right; how does he come back? Besides, Thompson can speak for himself. Ah, but much has changed. Because Thomas is holding out in a contract dispute (the running total in fines, including missing mini-camp, is more than $800,000), the Legion of Boom is gone. SS Kam Chancellor had a career-ending injury. Richard Sherman’s torn Achilles tendon and his conflicts with coaches got him cut and picked up by San Francisco (he’s being held out of the 49ers’ opener). Thursday unveils the new look: Thompson at free safety, Bradley McDougald at strong safety, Shaquill Griffin at Sherman’s left cornerback spot, and Byron Maxwell, a junior-grade Legionnaire when the Seahawks won the Super Bowl, in the right corner in his second tour of Seattle duty. How these changes add up is anyone’s guess, other than to say there’s no way they can approach their predecessors’ dominance, not in the first year together and definitely not in the first fake game. All they can do is not get hurt and try not to get embarrassed defending against Colts QB Andrew Luck, returning to action for the first time since what seems like the Civil War (Twitter users, you get my drift). Matters are further complicated by the injury absences of Seattle’s prospective primary pass rushers, ends Frank Clark and Dion Jordan, the replacements for Michael Bennett (traded) and Cliff Avril (retired from injury). The situation is temporary, but Luck could hardly ask for better fortune for his scheduled one quarter of play. Since nothing counts Thursday, it’s a good time for Thompson to take, if need be, a few falls down a few stairs. Carroll suggested as much. If Thompson shows he can’t hack it, the Seahawks are not without some backup. In free agency, they signed Mo Alexander, who started 19 games at safety over four seasons with the Rams before being cut in midseason. But since he’s out this week with a hip flexor strain, Thompson will get as much time as he needs to begin the onerous task of replacing a future Hall of Famer. Thompson talked with Thomas a week ago, just checking in, he said. But he doesn’t think about Thomas’s dispute with the Seahawks unless someone asks him. Carroll was fairly honest when he said the strangely unsettled secondary may take the month to get a clue. The fake game is the first of post-Boom life for the Seahawks. Keep the expectations low and don’t forget to look through the fingers after you put a hand over your face. Thanks Art. You totally crack me up! You are soooo correct. Earl and Cam were strengths that allowed the rest of the defense to succeed. Both were overwhelming threats in the variable position that is NFL Safety, especially the 1 1/2 to 2 players that Earl represented just by being on the field. They set the stage, for the other greats, Sherman, Wagner, etc, to be the totally effective top defense that they were. Who is setting the stage now, who rises up to be the difference makers to allow others to take chances and make plays? I guess we’ll see – it likely won’t be at free safety. We’re talking about something totally different than what we’re used to seeing the last few years, and maybe just an average defense. Time will tell. I’m kind of optimistic. Earl was always a known quantity, but Sherm was a fifth round pick, Kam a fourth rounder, and Browner was CFL. I remember watching a preseason with all of them years ago and Kelly Jennings fresh on the mind, thinking, ‘Huh, they might actually be good’. I love Sherm, but the Seahawks were probably right cutting bait, NFL Twitter is full of vids of him being burned in practices by guys you’ve never heard of. I’ll give Pete and John this, they can’t seem to be able to draft lineman for crap, but they do pretty well with linebackers and secondary. Good point about Wilson’s rookie year. I think most people, despite his strong preseason, would’ve kept him as a backup to learn the NFL ropes and given the starting job to Matt Flynn (I would have). Instead, look how that turned out. Let’s see how Thompson does in this preseason during Thomas’ absence.